Windows 10 October 2018 update is here, having skipped past the Release Preview phase, and can be downloaded now if you can’t wait for it to make an automatic appearance. While many observers (us included) expected a release date for Windows 10 to be secreted among the hardware ejaculations during last night’s Surface announcement, having the thing actually smack users in the face like an octopus flung by a seal was unexpected. This is because the last build, 17763, had yet to make it from the Slow Ring, where code that Microsoft reckons is relatively stable goes after a flirtation with the Fast Ring, to the Release Preview (RP) ring. While Microsoft is loath to use the phrase “Release Candidate”, the last two Windows 10 updates have turned up in RP prior to going live. It was in the RP ring that the showstopper bugs for the April 2018 Update were found. Things are a little different this time around, as Windows Insider MVP Jason Coombes observed, which prompted a response from one of the Windows Insider bosses, Brandon LeBlanc. To be fair to Microsoft, the RP ring is supposed to be for patches and fixes to the current branch but the change in tack will unnerve some still sore from the shenanigans around the April 2018 Update (which Microsoft reckons went fabulously well. Right.) 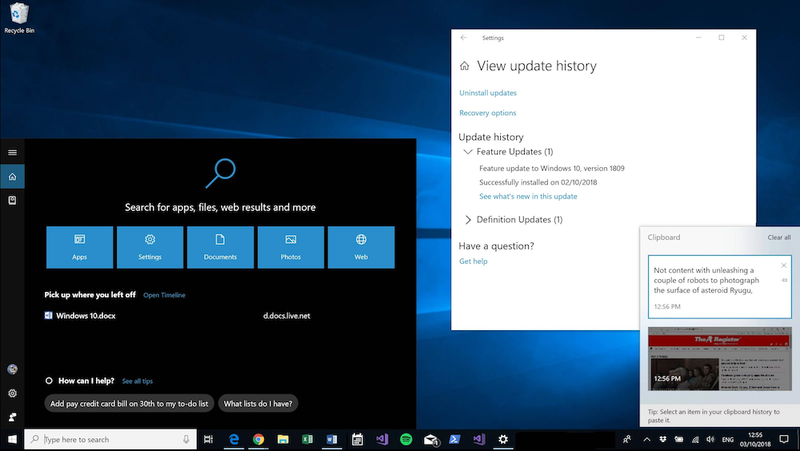 Members of the Release Preview ring will be seeing the build arrive automatically while ordinary users (El Reg included) have had to click a button in Windows Update to start the update process. Other users will see the build arrive when Microsoft’s AI reckons it is safe to fling it at their hardware. Microsoft’s confidence in the Windows 10 October 2018 Update stems from the fact that, frankly, there isn’t a lot in it. Big-ticket items such as Sets disappeared some months ago as Microsoft focused on the fit and finish of the operating system. Add-on applications such as Your Phone and a bit of buffing-up of the unloved browser, Edge, filled the gap along with some welcome UI tweaks. Your Phone is unchanged from its preview incarnations, allowing Android users who are willing to jump through the requisite hoops to download images from their phones as well as send and receive SMS messages. Microsoft has also said that mirroring of Apps from the phone to the Windows 10 desktop is also due to make an appearance (although not right now), which will make for some intriguing use cases. The Edge browser receives a lot of attention in this build, with a redesigned ‘…’ menu and settings options that Microsoft reckon will make navigation easier to users. A redesigned toolbar also makes an appearance and the whole thing has been given a bit of a beating with the Fluent Design stick. PDF improvements, the ability to turn off the accursed auto-play beloved by some websites, and enhancements such as an offline dictionary to improve the reading experience round out the changes, all of which make using the browser quite a pleasant experience. The nag screen at the start, suggesting users link their browser to their mobile device is, however, a bit less pleasant. Switched on by default is a useful clipboard history, which will stash plain text, HTML and small images and is accessible by hitting the Windows key and ‘V’. Sometimes the little things can be the most welcome. Search gets a truckload of changes (although the Cortana search box is disabled by default). The home screen has put on some weight, showing recently accessed items and more previews – apps, documents, email, people and so on now show up. And if you’ve bought into Microsoft’s cloudy world, search will also pick up email from Outlook.com and OneDrive. Cortana’s tentacles will reach far and wide if you let them. Screen-shotters get some love in the form of the Snip & Sketch app, and Windows Security (formerly known as Windows Defender Security Center) finally looks like it is actually part of the operating system thanks to a bashing with the Fluent Design stick. Oh, and there is now something called Dark Mode, which appears to be compulsory in all operating systems now. The setting is hidden away in the Colors section of the Personalisation options and, well, frankly isn’t that great right now. The issue is mainly down to inconsistent implementation over applications, which can make things a bit jarring as displays flicker between soothing greys and bright whites.